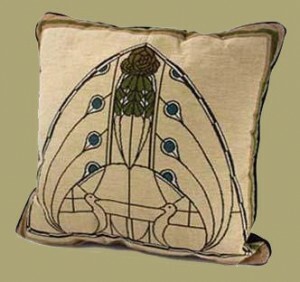 This peacock motif is adapted from drawings of a stained glass window design for the Roycroft Inn, 1906. As far as we know, this design was never executed. Poly/cotton blend with coordinating black cotton trim and back. Dry clean only. Measures 18" square. Matching placemat, table runner, and throw are also available. Made in the USA.